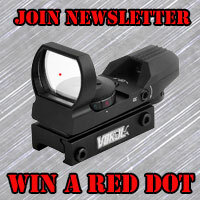 Join your fellow patriots and sportsman by adding your email to the GunData.org Newsletter, and win a red dot sight. 1 lucky person will be chosen from the mailing list at random and will win this Vokul Tactical 4 Reticle Red Dot Open Reflex Sight. Comes with a rail mount kit. Also has 8 various combined reticle color and shape settings. 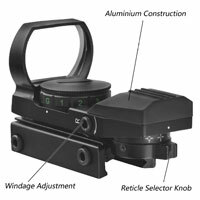 4 Seperate Reticles，Rail:22mm，7 Brightness Settings.Tubeless Open Reflex Design.